I prefer to keep my gaze on the road in front of me, but it's good from time to time to look back at where we've come from as we chart a course forward. Having said that, here's a quick look back at where PDAA began as we look toward the future. 1976: A group of eight companies - mostly fleet graphics producers - founded PDAA to network and share business with nationwide installations. 1993: PDAA invites about 15 other installer companies to join, including Rob Ivers Inc.
2000: At the request of PDAA's board of directors, Rob Ivers creates a training and certification program and opens the PDAA Kansas City training center. The goal of the training is to teach installers how to apply vinyl. There are three levels of certification: associate, professional and expert. Designations are based on installers' performance on level-specific hands-on tests. 2001: The testing center conducts nine certification exams, and 53 installers achieve either Professional or Expert status. PDAA hosts a deal rodeo at the testing center that summer - a demonstration or show-and-tell event - and invites 30 expert-level certified installers to participate. 2002: In the wake of 9/11, air travel becomes harder, travel budgets become tighter and the school closes. From 2002 to 2006, PDAA focuses on growing and building relationships with industry partners (primarily vinyl manufacturers). 2007: Ivers conducts Wrap Quest, a decal rodeo in Pompano Beach, Florida. He invites all vinyl manufacturers to attend, teach and provide vinyl, and sells tickets to the public. Manufacturers can show their product off to the 200 attendees at stations for a variety of scenarios - boat, rivet wall, brick wall, etc. - and they conduct a certification test at the end of the rodeo. The term "Master Certified" enters the PDAA vernacular. The following week, at the 2007 SGIA Expo, the Presidents of PDAA and SGIA (Nathan Franzblau and Mike Robertson, respectively) discuss the possibility of PDAA joining up with the installer group for SGIA printers. 2008: PDAA merges with SGIA. 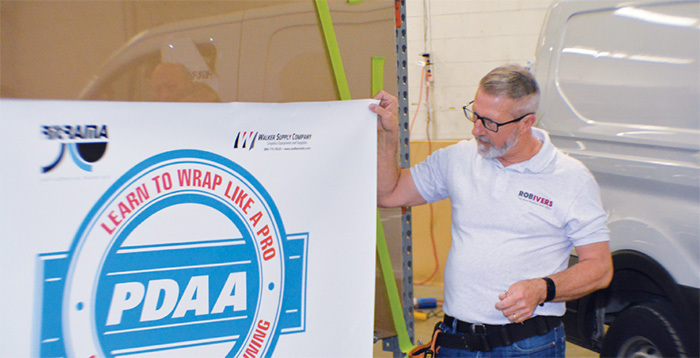 PDAA continues to train installers at Wrap Like a Pro events at the SGIA Expo and throughout the year, and SGIA adds the "Find an Installer" function to its website to help companies find certified installers across the country. Today, "Find an Installer" receives over 1,000 hits each month. Enough history. Let's focus on the future - and from where I sit, it's a bright future for SGIA's installer base. In 2018 we've made some changes to the Master Certification program that more accurately reflect what PDAA stands for - highly qualified installers with high standards who can handle any vinyl on any surface. When a company searches for a PDAA Master Certified installer, we want the best installers available to rise to the top of that search. Our goal is to build a strong and reliable certification program that continues to represent the best of the installer community. As of January 2018, SGIA and PDAA no longer function as separate membership organizations. All PDAA members are now members of SGIA. The installer community and the PDAA brand will remain, as will the Master Certified Installer designation. In the early days of PDAA, and after PDAA and SGIA merged, the certification designation belonged to the company, not the individual being tested. Moving forward, certification will be tied to the individual, and companies will be listed on "Find an Installer" as long as they employ at least one Master Certified Installer. Certification is a big investment for a company to make in an employee, so SGIA has designed a policy to create a fair and equitable individual certification. When a company pays for an individual to be certified, there will be a period of one year during which the certification is co-owned by the company and the individual. If the Master Certified Installer leaves the company within one year of achieving certification, neither the company nor the installer can use the designation for the balance of the year. Unless they have another certified installer on staff, the company will be removed from "Find an Installer." Additionally, Avery Dennison recognizes PDAA certification, giving these installers additional recognition as Avery certified installers and the benefits that designation brings. All Master Certified installers receive a digital badge that will allow them to promote their certification online and allows others to see what it took for them to become certified. This is probably a good spot to talk about the fees associated with membership and the Master Certification program. If a company wants to avail itself of the "Find an Installer," it must join SGIA as a corporate member ($300 annual dues). Companies that identify as installers will be on the "Find an Installer" listing. To take advantage of the Master Certified listing on "Find an Installer" and to promote the business as a PDAA Master Certified company, an installer needs to achieve the certification. Step 1: The installer takes the online assessment ($50, 25% discount for SGIA members) - 50 questions with a score of 80% required to pass. Step 2: After successfully passing the online assessment, the installer attends a one-day hands-on testing session, conducted quarterly at locations across the United States ($1,100, 25% discount for SGIA members). Acrylic test - The installer applies a piece of non-air-egress vinyl with mask to a piece of acrylic. The challenge is the acrylic is 4 feet by 8 feet, the vinyl is approximately 42 inches by 88 inches, and the high surface energy of the acrylic means that once the vinyl sticks, it remains stuck. Bubbles and wrinkles are the enemy of any good installation and a Master Certified installer needs to have a plan to deal with them. In my observations of testing, this is one of the most difficult tests of the day - though Ivers notes it is only hard to installers today because of the prevalence of air-egress vinyl. If you can conquer this test, you can handle any flat surface install out there. Rivet test - Air-egress vinyl is applied to a 4 foot by 8 foot rivet wall made up of two panels, and in the end, the vinyl should appear to be painted on the rivets. The real challenge here is managing the rivets and making sure that your vinyl lines up across the panel. Cut test - Installers cut a piece of vinyl with laminate without cutting the metal surface below. With the advent of knifeless tape, you might think this is unnecessary. However, there are applications where you may need to trim vinyl on a car with a knife - and cutting or scratching the paint is unacceptable. Car vinyl application test - Installers apply two large pieces of vinyl with a complex checkerboard background and a large logo to the side of a Ford Transit van, and the installer needs to deal with the channels and any other obstacles on the vehicle with as little distortion as possible. Step 3 : An installer who has successfully completed the online assessment and the hands-on testing is eligible for Master Certified status. To maintain this status, the installer or the company needs to pay an annual fee of $199, which allows them to be listed on the "Find an Installer" site. Yearly renewal indicates to SGIA that they are still in the installer business and maintains the Master Certified status. Individuals who allow Master Certification licensing to lapse for more than a year will be required to repeat the testing process. So what does the future hold for installers and SGIA? SGIA's PDAA Steering Committee has a number of great ideas about how we can improve this certification and even expand it to other areas. Think of paint protection, color change, and those that only want to install on "flat" surfaces such as interior installs. We're working on rolling these out as either individual certifications or as additional certifications for the Master Certified installers. SGIA is excited about what the future holds for this community and continues to look for ways to improve and grow this installer base and the certification program. Look for a class and certification near you and show the world you have what it takes! Ray Weiss, Director of Digital Print Programs for SGIA, joined the association in 2014. He provides solutions and technical information on digital printing as well as digital equipment, materials and vendor referrals. He oversees several workshops at SGIA along with the association's digital equipment evaluation program. Ray is the Project Manager for both the PDAA Certification program and SGIA's Digital Color Professional certification program and is an instructor for the Color Management Boot Camps. Ray is a regular contributor to the association's Journal and won the 2016 Swormstedt Award for Best in Class writing in the Digital Printing category. His 25+ year career in the graphics industry has spanned owning his own prepress and offset business to digital wide-format sales, training, support and service. Ray has extensive experience in color management and worked closely with the Smithsonian Institution to implement a color managed workflow in their Exhibits department. This article appeared in the SGIA Journal, March / April 2018 Issue and is reprinted with permission. Copyright 2018 Specialty Graphic Imaging Association (www.sgia.org). All Rights Reserved.